I'm really anticipating seeing this movie again. You are so right, it's a great film noir. In her autobiography, Yvonne DeCarlo said that this was an important movie in her career. It was one of the first opportunities to play in something other than a Western or a costume epic. Also, look for a young Tony Curtis and Richard Long in small parts. Thanks for the schedule tip. I'll be watching in the morning. Can't remember if I have seen Criss Cross or not. Roverrocks, be sure to let us know what you think of the movie. Difficult to think of many films that have an ending that is more pure film noir than Criss Cross. It seems to me that this film is not nearly as celebrated as it should be as it is, at the very least, one of the better films of its genre. The wonderful thing about its ending is that you can view it from the perspective of not only the protagonist (Burt Lancaster) but the antagonist (Dan Duryea), as well, being sympathetic towards the former, of course, but even the latter, to a degree. By the way, I could have selected a more explicit (and memorable) photo representing the ending but decided not to so as not to give it away to those who haven't had the opportunity to see Criss Cross yet. Excellent, most excellent. Great chemistry between Lancaster and DeCarlo. DeCarlo kept me guessing as to her true inner being the whole movie even when lying dead. She was a chameleon. At the end I felt a lot of sympathy for Duryea's character as he had been taken to the cleaners just like Lancaster had during the movie. DeCarlo was not a victim but rather she victimized the men around her even though she appeared very lovable and true. She was out for all she could get and that finally caught up with her. Poor Lancaster, he was sexually smitten beyond all saving. He was a dead man walking. The movie was fast paced and well acted. I would like to see it again to look for the nuances I know I missed with one viewing. The supporting actresses and actors all did a fine job as well. Enjoyed seeing a young Tony Curtis in his bit role. A very classic and classy noir. 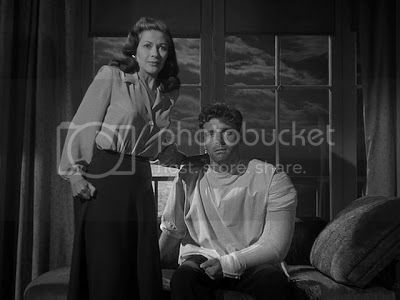 I like to contrast CRISS CROSS to OUT OF THE PAST, a film I consider maybe the best illustration of "noir" . The lead guy (Lancaster/Mitchum) is totally smitten by the girl and that seals his fate. We root for him, he's not a bad guy but he makes some bad decisions and gets trapped, and he wants to make amends but he's now doomed to fail and perish. The other guy (Kirk Douglas / Dan Duryea) is also genuinely smitten by the girl. He is a bad guy (criminal) but somehow we can emphasize with him too. The "femme fatale" has him making questionable moves that aren't in his best (business) interests. I have the impression that if not for the girl these guys could all get along somewhat. But they fixate on her and that leads to their conflicts. Now to the subject of the girl (Yvonne/ Jane Greer) . They are somewhat alike (both are attracted to the man that works best for the moment and they will use their charms to get what they want). But Yvonne is much more of an innocent , she seems to really be torn between her two men, each man gives her something she wants but neither can give her everything. Yvonne pays the price in the end but I feel a bit sorry for her. And as Tom points out even the bad guy Duryea rates a bit of empathy ( but not too much) . And I definitely feel some empathy for Kirk Douglas in OUT OF THE PAST. OOTP's Jane is clearly the evil femme fatale, there is never anything good in her intentions, and she really isn't capable of loving anyone. She uses her men and then has no hesitation to discard them. And she's very quick and lethal when she does that. There's a sense of relief when she meets her end, lest she go out and catch another guy in her web (and I could see me being that dumb sucker). The movie CRISS CROSS has a less complicated storyline and seems to move along more quickly, and it is a shorter film by about 10 minutes. But I still rate OUT OF THE PAST to be a notch above film in the end. Interesting comparison of the two films, mrroberts. Poor Bob Mtchum in Out of the Past. Just before he and the now proven rotten Jane Greer get into that car for their final ride together (he knowing that the police are probably waiting for them on the road), Mitchum says to her, "We deserve each other." Talk about a statement from a guy who doesn't think he's got much left to live for. One thing about Out of the Past: I wish they had stuck with the film's original title, Build My Gallows High, a noirishly fatalistic title if ever there was one. Perhaps the grimness of the film's ending would have been a little too telegraphed if they had, though. But I like the imagery of that title more than the rather bland (if descriptively accurate) title they finally selected. Tony Curtis appears briefly at the beginning of the picture, dancing with Yvonne de Carlo; he has no dialogue. Dan Duryea made a career of playing weak or villainous characters; here he is at his most evil. And the robbery sequence, with gangsters and guards moving through clouds of tear gas, is a nightmarish scene, brilliantly done. Dan Duryea has a lot of fans on these boards, we had a nice long thread dedicated to him not too long ago. (Maybe in the near future we should resurrect it). "Slimy Dan" ( for us fans that's meant as an endearing nickname) played a lot of despicable characters in the movies , and yet had a reputation as being one of Hollywood's nicest guys in real life. Dan's villain persona is at its best in CRISS CROSS. Dan's best film role of all may have been that of "Waco Johnny Dean" in the classic James Stewart western WINCHESTER 73, a film that fits most of the criteria for "film noir". Criss Cross is PURE film noir. The Lancaster-DeCarlo combo is fantastic in this one. Also, any movie set in the old Bunker Hill section of LA gets my attention immediately. It is the perfect noir setting. A 10 in all respects and a must have in any noir collection. Yes, near flawless and a film that has all the aspects what makes noir, well, noir. Also, I live 60 miles south of where the film was set and I just love noirs set in those subsections of L.A.
That is great. I'm a New Yorker, but love the mystique of old LA. When I visited I had to go downtown and ride, when it was still running, Angels Flight. I just imagined seeing the old Bunker Hill in my mind. I've read so much about the area and was so disappointed to read that not even one building was left. That was typical of the '60's and '70's in LA and in NYC too. If preservation groups didn't step in, we'd have lost Radio City Music Hall and Grand Central Terminal along with the old monumental Penn Station, Roxy Theater, Paramount, etc. I'm sure you have seen Cry of the City. This film really shows NY it all of it's noir glory. "Cry Of The City"! I always forget that one. That's a real gem. How could it not be with Victor Mature and Richard Conte. I love the whole scene with that big tough lady-masseuse. There are so many great NYC noir films. I would say "The Naked City" really ranks up there. The Naked City is the Gold Standard for NYC noirs but also check out The Killer That Stalked New York, While The City Sleeps, Kiss Of Death, Where the Sidewalk Ends, and The Unsuspected.